Hitachi developed IPS technology in 1996 to combat the laundry list of problems afflicting the TN panels of the day, especially poor color reproduction and limited viewing angles. Since then the technology has undergone tweaks and improvements with variants such as Super IPS (S-IPS), Advanced Super IPS (AS-IPS), and IPS Pro. Today most IPS panels use some sort of enhanced variant, but are still generally called “IPS.” These days LG Display produces the majority of IPS panels. IPS displays have several major advantages over those that use the more common and less expensive TN technology. Each red, green, or blue subpixel can display 8 bits (256 levels) of brightness or more, giving the display more-accurate color without resorting to tricks like dithering. IPS displays are capable of a wider total range of color, as well. For that reason, photographers and artists tend to favor them; most “professional” desktop PC monitors made for photography, design, print layout, and other color-sensitive tasks use IPS panels. Viewing angles are much wider on IPS panels, too. You’ll see proper color and contrast when looking at them from almost any angle, which makes them quite useful on smartphone and tablet displays. Apple’s iPads, the iPhone 4 and iPhone 4S, the Amazon Kindle Fire, and the Asus Eee Pad Transformer are just some of the mobile products using IPS displays. It’s not all upside with IPS technology, though. Generally IPS displays aren't as bright as comparable TN panels, and they don’t change state quite as quickly. Thus, it’s not yet possible to get the nice 120Hz refresh rates necessary for most 3D displays, and fast-motion graphics can sometimes leave a bit of a trail or “ghost” behind; modern IPS panels have minimized that problem, but they’re still not nearly as fast as TN panels. They’re also more expensive in general. IPS displays keep crystals aligned with the plane of the display, so they look the same from all angles. How it works: The structure of an IPS panel is very much like that of the TN panel explained earlier. The crystal structure is different, with all the crystals aligned horizontally (hence “in plane” with the display). 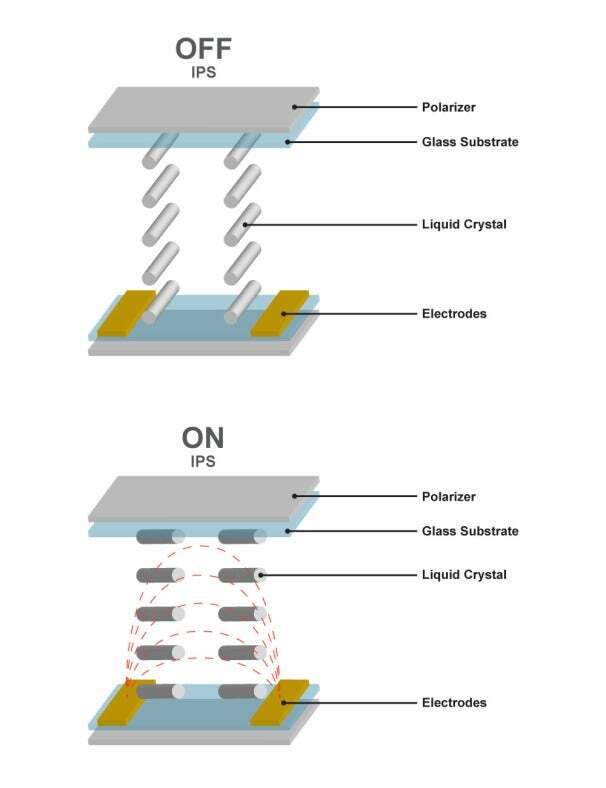 As opposed to TN panels, where one electrode is beneath the crystal and one is above, IPS displays require both electrodes to be beneath the display, taking up more room. This design allows a little less light to pass through, making the display a bit dimmer even when the backlight is shining just as brightly. When current passes through the crystal in an IPS display, the crystal structure rotates 90 degrees in parallel with the flat plane of the display, rather than turning vertically from parallel to perpendicular. The crystal turns further as more voltage is applied, letting more of the backlight shine through. Somewhere in between IPS (slower and dimmer, but very high quality) and TN (brighter with higher speed, but lower quality) you’ll find vertically aligned displays. Generally they have better color reproduction than TN panels do, and they can display 8 bits of brightness per subpixel, but they don’t produce quite as wide of a color space as IPS does. Viewing angles are generally much wider than those of TN, but not quite as wide as what you see on IPS. Response times are, again, somewhere between those of the other two technologies. You’ll hear a couple of different terms for VA panels, such as MVA (multi-domain vertical alignment) and PVA (patterned vertical alignment), which refer to slight variations on the technology. Modern VA panels all produce excellent, dark blacks and thus deliver very good contrast ratios. The Toshiba Thrive boasts an “IPS-like” display (according to Toshiba marketing), but it appears to have a VA panel. VA displays offer better viewing angles than TN displays do, and they produce deep blacks. 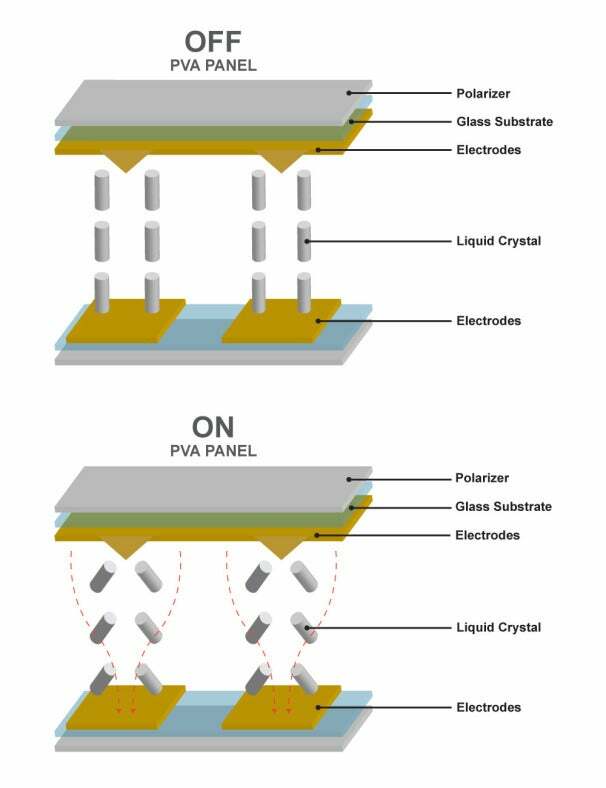 How it works: The general structure of a VA panel is very much like that of a TN panel; only the crystal structure differs. When no voltage is applied, the crystals are lined up perpendicular to the display (hence “vertically aligned”), blocking all light from the backlight. When a charge is applied, the crystals switch to align horizontally, allowing light to pass through. MVA and PVA panels have various crystals throughout the lattice skewed to different angles, so you get the same results when you look at the display at an angle.